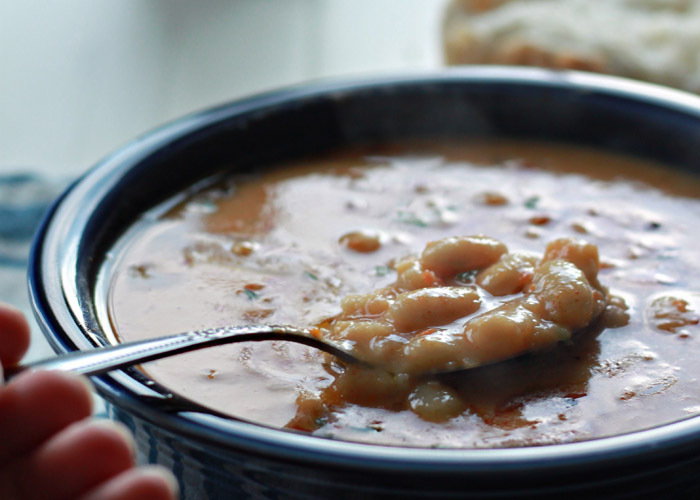 A homemade vegetarian version of the popular canned bean with bacon soup. You won’t miss the bacon – promise! Growing up, soup was just something that came from a can. In fact, when my mom would whip up a homemade soup (which she occasionally did and did well), I would be all suspicious. That’s not real soup, Mom! Well, things have changed, and canned soup is a rare exception in our house. Not only am I not a fan of how most of them taste, but I just like making it from scratch. And when I need a soup that’s as convenient as canned, it’s as easy as dipping into the freezer, where I keep extra batches and leftovers. There are a couple of canned varieties I do miss, though – not just because we hardly ever eat the canned stuff, but also because I’m a vegetarian. First on the list? Bean with Bacon Condensed Soup. Oh man. Smoky, a little thick, tastes like home. I don’t remember ever seeing an actual piece of bacon in there, but it was still delicious. The lack of actual bacon pieces, however, kind of can mean it lends itself well to a homemade vegetarian version. Right?! 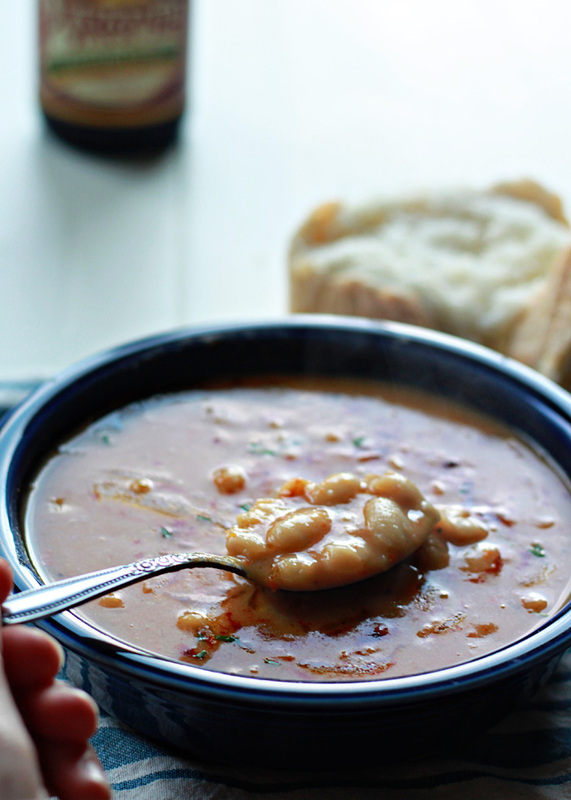 Thanks to smoked paprika and fresh rosemary, this Bean without Bacon Soup tastes plenty smoky. 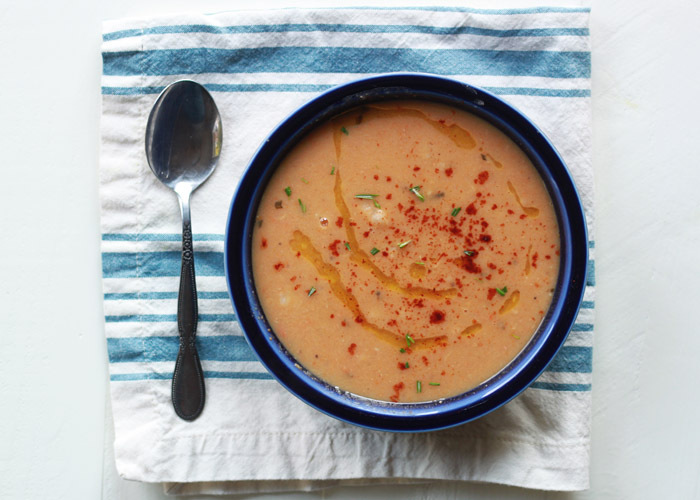 This is a super duper simple soup to whip up. First, a little saute for the veggies – with both butter and olive oil (a bit of both gives the final soup a little more oomph, but you can skip the butter for a vegan version and still be plenty happy). And then some garlic, spices, broth, beans, and a bit of a simmer. Puree for a thickened, full-bodied soup without roux or cream (did I mention this is a pretty healthy soup, all told?) – and then stir in a few more beans for texture. Voila. Who needs cans and bacon? Not us, man! Not us. Heat the olive oil and butter in a large saucepan over medium heat. Once the butter has melted, add the onions and carrots and saute, stirring occasionally, until softened, about 5 minutes. Add the garlic, smoked paprika, rosemary, salt, and pepper, and cook, stirring, for another minute. Add the broth and 3 cups (or 2 cans) of beans. Increase heat to medium-high and bring to a boil. Reduce heat to medium-low and simmer until the veggies are tender and the soup has reduced a bit, 15-20 minutes. Remove from heat and let cool for a couple of minutes until safe to handle. 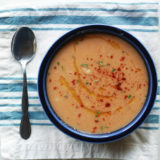 Using an immersion blender or working in batches with a blender, puree the soup. Return to the pan and return to medium-low heat. Add the remaining 1 1/2 cups (or 1 can) beans. Stir to combine. Return to a simmer until the beans are heated through. Ladle into bowls and drizzle with olive oil, a dusting of smoked paprika, and/or a few chopped fresh rosemary leaves, if desired. Soup keeps refrigerated in an airtight container for 2-3 days, or freeze for up to 3 months. * I call for low-sodium broth so that you can better control the amount of salt in the overall soup. If you have full-sodium broth, I recommend reducing or omitting the 1/2 teaspoon salt and then adding some if you find it needs it at the end of the recipe. Use olive oil (3 tablespoons total) instead of butter. 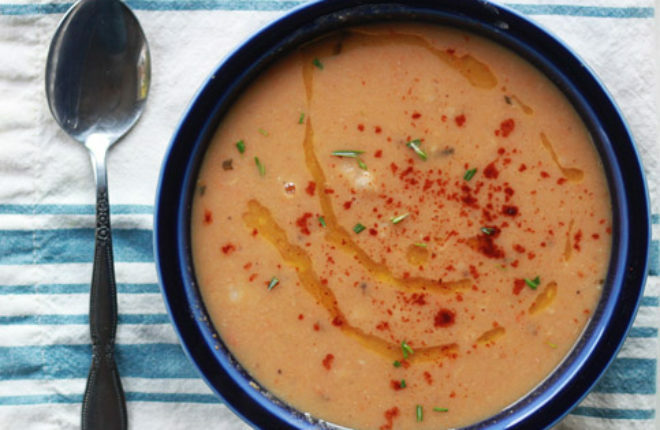 Bacon or no bacon, this soup looks AH-mazing! I don’t eat canned soup anymore either, although I admit I was obsessed with Campbell’s Steak and Potato soup when I was a kid. Now the thought of canned meat anything really grosses me out. LOVE this fresh and tasty soup, Kare! This sounds amazing! So silky and smooth and delicious, it sounds perfect for the cooler months 🙂 and I love how you got all that smoky flavor in there. Pinned! Your ingredient list includes butter, but your instructions don’t mention it. Thank you for letting me know my error; fixing the recipe now! So, I’ve never had the canned version, but we just cooked up your recipe tonight and it’s very tasty! I have to admit that I didn’t have smoked paprika on hand, so I used Spanish and added just a tad bit of liquid smoke. I also only used 2 cans of great northern beans (because I didn’t have 3), but I would probably do that on purpose next time because I like it more soup-y. We just finished eating this with good toasted oatmeal bread and I’m so grateful we had a fast fall recipe to make tonight. Thank you so much! I cook oil free. Can this soup be made successfully without the addition of oils or butter or extra fat? Yes, though that does account for some of the flavor. The original “Bean with Bacon” soup used to be one of my favorites growing up, so I was delighted to come across this recipe. It’s really very good. I did add smoked salt. Next time, I think I’ll try liquid smoke instead. Thanks for a great recipe! This recipe gets 1 star and that’s only because of the picture. I followed the recipe exactly. The amount of vegetable broth is not nearly enough for this. It looks like refried beans after purée. I’m having to add a ton of water. It also says to throw in the remaining beans until they are cooked through. The only problem is they aren’t cooking because the batch is scorching on medium. At this rate, it won’t be done for hours. The flavor leaves much to be desired. My husband tried it and is begging me to add some bacon to enhance the flavor. Hi Nicole, the recipe actually calls for cooked beans – canned beans or beans that have already been cooked. It also says to add remaining beans after they are heated through – not cooked through. Attempting this recipe with raw beans definitely sounds like a recipe for disaster (literally!) I hope you try it again with cooked beans; I think you’ll like it a lot better! Made this several weeks ago and my whole family (vegetarian) LOVED it. I miss the Bean with Bacon soup of my youth and this absolutely reminded me of that classic. But, it was better. Much better. I followed the recipe exactly and it turned out. I came back looking to make it again and was confused by the 1 star review–the soup I made was NOT a 1 star soup. It was really, really good. Hi Stephanie, thank you so much for the review! I’m so glad you loved it as much as we do. THANK YOU! Please disregard that 1-star review, this soup is amazing! The recipe clearly states that canned/cooked beans are used, not dried, which I’m sure would make for a disaster. Made this for dinner tonight, and it is definitely a yummy and healthier version of the canned soup I grew up with. I added a splash of liquid smoke at the end to boost the smoky flavor from the smoked paprika. Thanks for this recipe!